Business method abstract idea rejections continue to get reversed at the Board, sparking form over substance debate? In today’s Anticipat Recap email (March 22, 2018), three decisions at least partially reversed abstract idea rejections for business method claims. One of the decisions, Ex Parte Gershfang et al (PTAB Mar. 22, 2018), even included a dissenting opinion. Here, we report on an interesting decision pulled from another decision, Ex parte Beach (PTAB Mar. 22, 2018). Before getting into Beach, some context behind the debate about form over substance of patent-eligibility. The Supreme Court in Alice v. CLS Bank struck down the method claims as abstract ideas, but also, importantly, struck down the computer system and computer readable medium claims for the same reason. The Supreme Court did not want clever practitioners to be able to get a claim based on the draftsman art. So just because a claim included computer recitations did not, by itself, make the claims more than an abstract idea. For this reason, it is very rare for the Board to split the claim set baby. For the most part, either all the claims are upheld as abstract or all the claims are reversed. redeeming the financial instrument for at least one of cash and merchandize [sic merchandise] when the information received from the database indicates the financial instrument is valid. The Board found claim 58 to be a patent-ineligible abstract idea. a recognition subsystem configured to read the code off the financial instrument and send a related query to the database for information related to the financial instrument. So here the Board holds that for a coin machine system claim, the structure of a coin input region, the coin discriminator to count the coins, the printer to print a voucher and the dispenser to dispense the voucher makes a claim patent-eligible. Beach shows that the Board is willing to affirm some claims that were rejected as abstract ideas while reversing others. This is important because it shows that after Alice, the Board appears to be able to analyze the claims in a very much nuanced manner. Indeed, the extent that structural claim recitations can render a claim not abstract is far from over. But when it comes to a coin counting machine, these structural limitations were sufficient for the Board. The Board will likely continue to render affirmed-in-part determinations on patent-ineligible judicial exception rejections only in rare cases. But we will report of any trends that develop. Most people would not consider patent prosecution an electrifying conversation topic. Patent practitioners can be stereotyped as the most likely to wear a pocket-protector. And knowing how much of a practitioner’s time is spent staring at patent documents, it is with little wonder that practitioner social abilities do not measure up to societal expectations. But with the advent of big data, times are changing, as shown in a recent DataCrunch podcast episode that focuses exclusively on getting patents. The relevant episode, published on March 27, 2018 as”The Patent Law Land Grab“, can be accessed by subscribing to the DataCrunch podcast on iOS and Android devices. You can also access the episode directly on the DataCrunch website here. In the episode, the podcast walks through the patent process in a way that even someone unfamiliar with patents can follow. Trent Ostler discusses the fundamental balancing act in getting a patent. He also discusses how big data is playing a role in improving the patent prosecution process, including discussing Anticipat.com. Janal Kalis, partner at Schwegman, Lundberg, Woessner, joins the episode as well to discuss this intersection between big data and patent prosecution. Feel free to check out the podcast, especially this episode. Perhaps after listening to the episode, you will see that the allure of patent prosecution is here to stay. But perhaps not. This is the first of a series of posts that goes over the ex parte appeal process in patent prosecution. 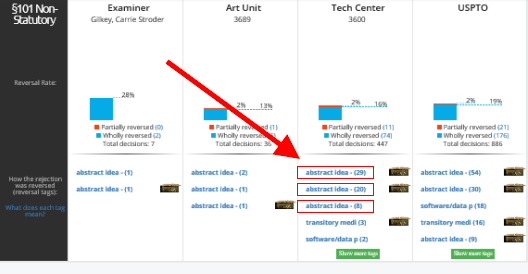 At https://anticipat.com, we are finding tremendous value from analyzing appeals decisions at the PTAB. Here, we go over the standing requirements for when an application is eligible to be appealed. In short, there must be an appealable issue (instead of petitionable) and the application must be twice rejected. The first distinction that must be made is issues of appeal versus issues of petition. In general, an objection is petitionable whereas a rejection is appealable. However, when the objection is “determinative of the rejection,” the matter may be addressed by the Patent Trial and Appeal Board (PTAB). An example of this a new matter objection for the specification with a Section 112 rejection for the claims. Both can be decided by the Board if the new matter objection is determinative of the Section 112 rejection. If the issue is indeed an appealable issue, the next question is whether that rejection has been applied twice. In general, once an application is twice rejected, it is eligible to be appealed. This standard comes from a codified rule: “Every applicant, any of whose claims has been twice rejected, may appeal from the decision of the examiner to the [Patent Trial and Appeal] Board (PTAB) by filing a notice of appeal . . . ” 37 CFR 41.31. Based on the wording of the rule, one might see some ambiguity as to whether the exact claims must be rejected twice to be eligible for appeal. But there is no such exactness requirement, as established in a precedential Board decision Ex Parte Lemoine, 46 USPQ2d 1420 (Bd. Pat. App. & Inter. 1994). So as long as an application has been rejected twice, it is eligible to be appealed. See MPEP §1204. And the rejection is not limited to only be for the exact same application. If any claim was rejected in a parent application, and the claim is again rejected in a continuing application, that continuing application is eligible for an appeal. See MPEP 1204(II). This is supported by the same Lemoine decision. Stay tuned for updates for other interesting information on the timeline of the appeal process. We have previously reported on the very low reversal rates of abstract idea rejection within tech center 3600, home of business method art. Indeed, over the past few months, the reversal rate has been about 12%, as shown on the Anticipat Research database. But the Federal Circuit has recently pushed the Alice test closer toward patentees, and the Board appears to be following their lead. This is shown in a pair of recently-decided appeals involving business method applications. In Ex parte Bhogal (PTAB Mar. 19, 2018), the Board found that the claimed method recited more than the alleged abstract idea by “adding a specific limitation other than what is well-understood, routine and conventional in the field.” The Board acknowledged that the claims at issue, like most business method claims, recites generic computer, network and Internet components. But citing Bascom, panel noted that the inventive concept can still be found in the non-conventional arrangement of these pieces. Here, the appellant had argued that a claimed rendering order prioritization technique is not well-understood, routine, or conventional. The Board found this argument persuasive, noting that the Examiner did not set forth with sufficient specificity or provided any finding that this claimed technique is routine, conventional or well-understood. Importantly, the panel cited to Berkheimer v. HP Inc., No. 2017-1437, slip op. at 14 (Fed. Cir. Feb. 8, 2018) for the proposition that “[w]hether something is well-understood, routine, and conventional to a skilled artisan at the time of the patent is a factual determination.” Without such a factual finding by the Examiner, the Board found that the rejection was improper and reversed. It is interesting to note that the Berkheimer Federal Circuit decision very recently issued: February 8, 2018. We have seen Board panels quickly adopt Federal Circuit in the past, as reported here. So the Board appears to be going out of its way to use the decision in its analysis. This may signal that the Board is eager to make patent-eligibility holdings at trial consistent with examination. In another appeal decided the previous day, Ex parte Hoff (PTAB Mar. 16, 2018), the Examiner had argued that there is no requirement to provide “documentary evidence to demonstrate abstractness.” Answer 9. But the Examiner had only looked at the claim elements individually. In response, the Board quoted Bascom that “the inventive concept inquiry requires more than recognizing that each claim element, by itself, was known in the art.” In view of the Appellant’s explanation of the effect of coordinated claim elements, the rejection does not sufficiently establish that the combined activity of various claim elements, as identified by the Appellant, fails to constitute significantly more than the abstract idea itself. Both decisions involved applications with claims that have generic, conventional hardware that individually were not inventive. But the Board found in both cases that the Examiner had failed to establish on the record that the unique combinations of the elements were merely conventional or routine. Without such findings, the rejections were reversed. The PTAB will continue to side with Examiners in affirming many abstract idea rejections of business method applications. But the recent reversals show that a compelling argument lies in the novel arrangement of claim elements. This is especially compelling if the Examiner has not established on the record that these elements are conventional or routine. We recently reported that the top patent firms (by registered practitioner as featured on a Patentlyo post) pursue ex parte appeals very differently. This, despite apparent equal knowledge of the benefits of pursuing an appeal to further prosecution. While this finding is interesting, pursuing an appeal and winning on appeal are two different things. Here we report on the differences in appeal outcomes along the three firms Finnegan, Fish & Richardson, and Knobbe Martens. As brief background, we have found that average reversal rates among the various grounds of rejection to be quite stable. In a recent post, we reported that across the entire USPTO, § 101 has about a 20% reversal rate on appeal, §§ 102 and 112 hover at about 50%, and § 103 is around 33%. To look at these firms’ outcomes, we used Anticipat’s Research database and Practitioner Analytics between July 25, 2016 through March 12, 2018. The above three firms exceed the USPTO reversal rates in almost all aspects. Finnegan first. For the 59 rejections of § 103 obviousness, 28 were wholly reversed. This is a complete reversal rate of 47%, much higher than the average rate. Of 16 decisions deciding § 102 anticipation, 12 were wholly reversed. This is a reversal rate of 75%, again much higher than the average rate. The § 112 rejections were decisively overturned. Of 10 rejections, 9 were overturned. This translates into an 90% reversal rate–very high. Section 101 was the one ground of rejection that underperformed the rest of the grounds of rejection. Of the 14 decisions deciding § 101 rejections, Finnegan had two reversed. This is a reversal rate of 14%, slightly lower than the average. These data show that for the most part, Finnegan knows how to pick good candidates for appeal and/or how to advocate for a favorable outcome. Next Fish. Of the firms analyzed today, Fish has the greatest tolerance for pursuing appeals. Because of this, the reversal rates for some rejections are lower. But this also means an overall greater number of reversals than the other firms. These data for Fish show slightly lower reversal rates than Finnegan. The reversal rate for § 102 is 66% which is still much higher than average. Next, the reversal rate for § 103 is also higher than average at 46% wholly reversed. Next, § 112 falls right under average with a 44% reverse rate. Next, § 101 has two reversals. Given that there were 15 total decisions with § 101 rejections, this is a 13% reversal rate, which falls slightly below the average reversal rate for this rejection. Fish’s appeal strategy more closely resembles the Michael Jordan quote: “You miss 100% of the shots you do not take.” Similar to basketball shots, the more a correspondent appeals, the lower the success rate may be. As we have previously reported, Fish has a much greater number of total appeals, implying it pursues appeals more frequently than the others. This may mean that the firm pursues appeals that it is not as confident that it will win on. But like basketball shooters, because of the volume of appeals, it means that more applications will be reversed and thus take advantage of the benefits of pursuing an appeal. Fish should be recognized for taking more cases to appeal and still succeeding at or close to average reversal rates. If Fish wanted to identify areas for improvement, perhaps § 101 and § 112 would be on the list. While certainly not bad to overturn the Examiner’s 112 rejection 50% of the time, that is about the percentage of all appellants. Same is true for § 101, notwithstanding the challenges of appealing abstract idea rejections. The third firm is Knobbe. Knobbe files the fewest number of appeals among the three firms. The data show very high reverse rates, but because of pursuing fewer appeals compared to the other firms discussed here, the result is fewer total reversals. For § 101 rejections, Knobbe has two reversals out of 5, meaning a relatively high reversal rate of 40%. It achieves the same number of reversals with much fewer appeals than Fish and Finnegan. For § 102, 71% of rejections are wholly overturned. This is higher than the average even though not as high as Finnegan and Fish. For § 103, 56% of rejections are wholly overturned. This is much higher than the other two firms. Factoring in the six affirmed-in-part rejections on § 103, the number of decisions where at least one claim was reversed is at 67%. For § 112, 71% of rejections are overturned. This is much higher than average. The data on Knobbe seem to show something of their appeal strategy. That is, Knobbe tends to appeal cases that they are more sure that they will win on. And it shows in the high reversal rates. One note about all firms is the reversal rates for obviousness-type double patenting. All these rates are low, but many of the rejections were not argued on appeal. Thus, these summary affirmances imply that the applicant may opt to file a Terminal Disclaimer to overcome the rejection. These and other law firm-specific outcome data are important in two ways. First, having detailed outcomes for specific grounds of rejection can point out areas for improvement. If a firm is below the average reversal rate for a grounds of rejection (especially below the average for a particular examiner or art unit), there might be some learning opportunities to increase the reversal rate. For example, an area for improvement for Finnegan could be § 101. That being said, achieving two reversals in 15 attempts is not bad. Anticipat Practitioner Analytics provided an easy search interface that can retrieve all reversed applications for a particular ground of rejection, for an Examiner, his art unit, or technology center. Further, it allows for any customer numbers to be queried if you want to competitively analyze certain filers. The law firm or customer number analytics has its limitations. For example, just because a law firm has a low reversal rate for § 101 does not mean that they are of worse quality counsel than others. They may, for example, be taking on more difficult cases. But having the internal context of these cases can powerfully guide prosecution strategy. The second way these data are important in helping to show the optimal level an applicant should appeal. Remember that how often to pursue an appeal affects the reversal rates. A firm such as Knobbe that is more selective in its pursuit of an appeal than a firm like Fish–all advocacy being equal–will have a higher reversal rate, but fewer reversed decisions. For example, let’s say there are 100 candidate applications that could go up to appeal. For simplicity sake, assume each has a single pending ground of rejection. A Knobbe type of firm only pursues an appeal for its three most egregious cases and pursues claim amendments responses for the rest. In this situation, there’s a high chance these three cases get overturned (because they are the most improper of the bunch). Let’s say that two get wholly reversed, resulting in a 66% reversal rate. But let’s say a Fish type of firm with the same candidate applications is less choosy and decides to appeal the 10 most egregious rejections. Some of these rejections will not be overturned because they are less clearly improper rejections. So this firm could have a lower reversal rate of 50%. But because the firm decided to appeal more applications, even with a lower reversal rate, that firm is still getting three more notices of allowance with all the benefits of an appeal. In conclusion, feel free to lookup and monitor appeal decisions using customer numbers on Practitioner Analytics. Armed with the right material, you can see where you or others are strong and see where you have opportunities. This can also be used for showcasing expertise and advocacy in certain areas, e.g., for marketing. How does the Board incorporate very timely case law in their decisions? How can you use this to your advantage? We consider these questions as we discuss a recent Board decision that reversed an abstract idea rejection while incorporating a very recent Federal Circuit into its analysis. In a recent decision, Ex parte Jang (March 1, 2018) (available at https://anticipat.com/research?id=104015), the Board reversed an Examiner’s Section 101 rejection. In so doing, the Board panel found that the claimed software invention was not directed to an abstract idea under step 1 of the Alice/Mayo framework. Interestingly, the Board analogized to a Federal Circuit decision that had been decided not six weeks prior. This recent Federal Circuit decision that the Board cited, Finjan, Inc. v. Blue Coat Sys., Inc., 879 F.3d 1299, 1303 (Fed. Cir. 2018), was not merely a cursory citation or a footnote. Rather, the Board specifically analogized to the patent in Finjan in holding that the claims at issue were similarly not directed to an abstract idea. How did the Board incorporate this legal authority into its own decision so quickly? One thing that can be ruled out is any help from the appellant. Often times, the Board does indeed borrow persuasive arguments from the applicant (including persuasive legal authority). At times, you can see arguments literally lifted from appellants’ appeal briefs or reply briefs, as discussed in this blog post. Not so here. The reply brief was filed in September of 2016, long before Finjan was decided. Plus, the appellant choose not to pursue an oral hearing, which would have given the appellant a chance to address more recent case law. See 37 CFR 41.47 (“Upon a showing of good cause, appellant and/or the primary examiner may rely on a new argument based upon a recent relevant decision of either the Board or a Federal Court.”). Instead it appears that PTAB judges keep very current on Federal Circuit case law and use it in their own decision drafting. This is somewhat different from examiners, who, in the face of a recent Federal Circuit decision, may have problems addressing the applicability of recent Federal Circuit decision. The Examiners may instead prefer the USPTO to interpret any new Federal Circuit decisions in an official USPTO guideline. Now that we know that the Board analogizes to recent legal authority, how is this useful? How can you use the fact that the Board regularly cites to recent and relevant case law in reversing Examiner rejections? It turns out that this is most useful in fast-evolving areas of law, such as Section 101. 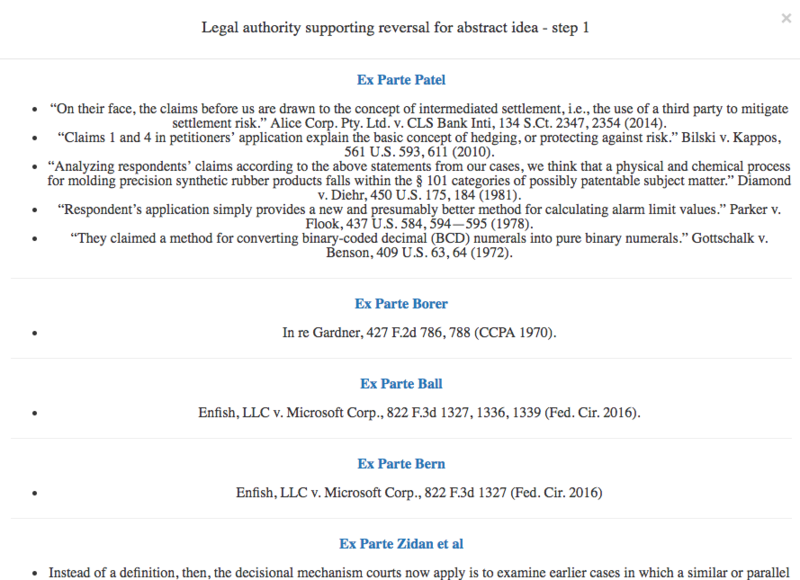 For example, you can cite to the same legal authority that the Board uses to overturn your own Examiner rejections. As we pointed out in a recent blog post, you can input any application number into the Anticipat Practitioner Analytics input field, and it will show the relevant legal authority for this application. Let’s say that you have an application in the software arts that is meeting stiff Section 101 headwinds. Perhaps, your application is even in the technical space of encryption. Let’s even say art unit 3621 (the same art unit that Ex parte Jang was decided). After inputting art unit 3621 into the Analytics input field, you will see that the art unit field has legal authority for step 1 of the Alice/Mayo framework. There are three decisions where the Board relied on step 1 of the abstract idea test to reverse the rejection. In addition to Finjan, this Board decision used two other Federal Circuit cases in reversing the rejection: Enfish and Thales Visionix. Chances are that if you have an application in this art unit and are facing a similar stubborn rejection, accessing legal authority that the Board found worthy of overturning an examiner can help guide strategy for what is persuasive. At best, the relevant legal authority is also found to be analogous and persuasive in your case. At worst, you are not completely off-base in citing to such a decision since independent judges in this art unit analogized to such legal authority. The next column, tech center, has even more decisions and legal authority. Finally, the right-most column displays all the tags for this specific tag. This will provide all the legal authority Board decisions. This practice tip is well-suited for responding to Office Actions as responses under 1.111 because you can quickly use recent legal authority. In theory, this same legal research could guide an applicant preparing for an appeal. This is especially relevant since if judges are using specific legal authority to overturn specific rejections, chances are they will be receptive to such legal authority in your brief. However, due to the substantial delay in reaching a final decision, and due to the volatility of Section 101, some of the cases may be outdated by the time the panel decides your case. See what Practitioner Analytics can do for your practice. Feel free to give Analytics a 14-day free trial. Let us know if you have any questions or if you would like a demo. Having the most relevant and current legal authority to advance a particular argument is a time-consuming task. But it is also a very important part of persuasive advocacy in patent prosecution. With Anticipat, we channel PTAB decisions to do much of this work. Anticipat Analytics shows you relevant legal authority (e.g., case law, Guidelines, and MPEP support) that the Board relies on in overturning specific rejections. The legal authority that the Board relies on to overturn a particular rejection in a given tech center can relevant for responding to a pending Office Action. If it worked on appeal in a related case, that authority might be good to look at in your case. And it isn’t only relevant for a case that you are appealing–it can be persuasive when working with your Examiner. To understand how to use legal authority on Anticipat Analytics, a little bit of background first. Legal authority goes hand in hand with the corresponding argument. We previously explained how Anticipat Analytics breaks down the most common arguments used by the Board in overturning a particular rejection. The legal authority goes a step further by showing the legal authority relied on in making this particular reversal. The most common tag for abstract idea is “Abstract Idea – Step 1.” This means that when the Board is reversing abstract idea rejections, most often it does so in step 1 of the Mayo/Alice framework. Within step 1, which legal authority does the Board cite to support its reversal? This is where the legal icon to the immediate right of the tag comes into play. The Examiner column shown above has the most relevant tags and authority to an application (e.g., they represent Board decisions that have overturned this specific Examiner). But they also have the smallest sample size. The next column, art unit, has more decisions. It provides all the decisions (and legal authority) for this art unit. The next column, tech center, has even more decisions and legal authority. Finally, the right-most column displays all the tags for this specific tag. This will provide all the legal authority Board decisions. This legal authority icon immediately to the right of the abstract idea text is clickable, which reveals the full list of legal authority for step 1 in this tech center. When the legal authority icon is clicked, here is an image of the popup that shows. Having the relevant legal authority for specific arguments used by judges can help guide strategy in what is persuasive. Please reach out to us with any questions or comments. We’re standing by for any questions or comments.